Home » General Health » What Is Anasarca and How Can It Be Treated? Edema and anasarca are very similar common occurrences. Contrary to what you might think, they’re not diseases or illnesses in their own right; in fact, these are very severe symptoms of a wide variety of illnesses and shouldn’t be ignored by any means. Fluid is naturally present throughout the body (within cells, within the areas between cells, in the blood, and within the lymphatic vessels). It helps keeps the organs and joints vital and moisturized. Normally, hydrostatic pressure (the pressure that liquid in a confined space exerts) pushes the fluids from high pressure areas to low pressure areas. Osmotic pressure pulls the fluid from parts of the body with low electrolyte concentrations to areas with high electrolyte concentrations. These fluids are concentrated with electrolytes, waste, vitamins, minerals, and other nutrients that must be distributed throughout the body to promote regular functions. 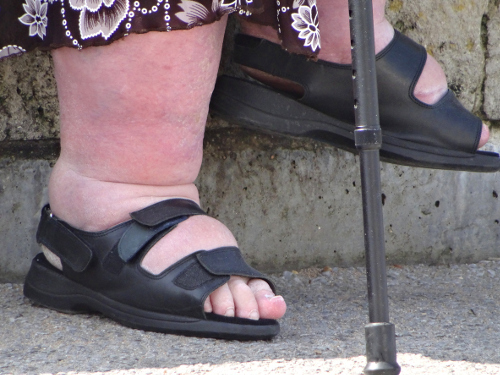 What Is Anasarca and Edema? What Are the Causes and Symptoms of Anasarca? Edema is the unceremonious accumulation of fluid in any given part of the body, and it signifies that something is amiss. Localized edema causes severe swelling in the joints and organs. So, what is the standard anasarca definition? Anasarca is an advanced form of edema in which the inflammation spreads to multiple parts areas or the entire body. It should be treated immediately because it’s usually a symptom of a much more serious underlying disease. To properly treat edema and anasarca, your doctor must first diagnose and treat what’s causing it. Severe edema can also occur when there’s too much hydrostatic pressure pushing fluids into tight tissue spaces and an insufficient amount of osmotic pressure to pull the fluids into vessels on the other side. This makes the vessel walls nearly impermeable, and eventually, the tissue spaces become engorged due to an overabundance of fluids. Additionally, it can occur when the body retains large quantities of liquid for an extended period of time, causing the liquid to spew forth into the space between the cells. This excess liquid in the hypodermis can lead to either localized edema or anasarca. Anasarca symptoms depend on the disease that’s causing it. They can range from shortness of breath to reduced urine output to nausea, vomiting, and extreme fatigue. There are two types of edema: pitting edema and non-pitting edema. The former is characterized by the fact that even the slightest amount of pressure applied will create a temporary indent in the affected area, whereas the latter doesn’t change its form at all. The process for diagnosing anasarca can be long and tedious because it could be linked to any number of physical problems. Most likely, your doctor will have to run a series of blood tests and other types of tests to accurately determine the underlying cause. First and foremost, your doctor will have to determine whether the inflammation is localized or generalized. Localized edema is much easier to treat because the problem is sustained in a single area. Localized edema is most likely the result of an injury or a venous or lymphatic obstruction that will heal on its own once the obstruction is removed. Then, your doctor will run tests to check your albumin (an important protein that’s absorbed in your urine) levels to rule out hypoalbuminemia. Dangerously low or high albumin levels could be a sign of nephrosis (urine absorbs protein at alarming rates or insufficiently), malnutrition, or liver cirrhosis (eventual liver failure caused by depletion of healthy tissues in the liver). Once your doctor has successfully ruled out all of the above health problems, they will check for chronic heart disease or impending heart failure. Sometimes, the right ventricles of the heart fail to pump a sufficient amount of blood for one reason or another. This can lead to fluid retention in certain parts of the body. Prescription and non-prescription drugs such as steroids, estrogen pills, and blood pressure medications could also be the culprit and should be examined by your doctor in their quest to diagnose your edema or anasarca. Anasarca isn’t actually a disease in and of itself. It’s a severe side effect of various potentially life-threatening diseases that hinder or alter normal bodily functions; therefore, it can’t be directly treated. The only way to alleviate anasarca is to get to the root cause of it, which is why accurate and efficient diagnosis is imperative. Certain illnesses are more easily treatable and conquerable upon early diagnosis. In patients with congestive heart, liver, and kidney failure, various diuretics are necessary to help regulate sodium levels throughout the bloodstream. Hemodialysis combined with reduced sodium intake is an effective treatment option for patients suffering from liver or kidney failure. It drains the excess fluid in the space between the hypodermic cells. Patients who are enduring anasarca due to an overactive thyroid problem will generally benefit from various physician-monitored thyroid replacement therapies. On the other hand, anasarca caused by second- or third-degree burns can be supplemented by large fluid intakes to stay hydrated and facilitate electrolyte regeneration. If malnutrition is the culprit, then doctors will usually implement strict high calorie, fiber, and protein diets to facilitate proper nourishment in their patients. Nutrient shots might even have to be administered to get the nutrients into the patient’s system faster. The only way to ease anasarca caused by drugs or prescription medication is to either immediately stop taking that drug or wean yourself off of it under the supervision of a healthcare professional. Anasarca might not be a disease, but that doesn’t mean it should be left untreated. It’s often a sign of a much deeper medical issue that’s been ignored or left untreated for far too long. Once the disease or illness has progressed to the stage of severe visible inflammation, then treatment is absolutely necessary. “Fetal anasarca,” Radiopedia.org; https://radiopaedia.org/articles/fetal-anasarca, last accessed May 23, 2017. “Anasarca,” Britannica.com; https://www.britannica.com/science/anasarca, last accessed May 23, 2017. “Hypoalbuminemia,” Wikipedia, last edited October 17, 2016; https://en.wikipedia.org/wiki/Hypoalbuminemia, last accessed May 23, 2017.